This project started because I wanted to do something different. I had been doing camera rockets exclusively for over 12 years and wanted a different challenge. 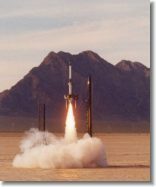 When I considered an upscale of a model rocket, I knew the only choice for me was the Mars Snooper II (Photo 1). It was first released by Estes in 1975 and ran through 1980. Because of its futuristic design I thought it would be a challenge and an attention getter. It proved to be both. I had a Mars Snooper II a long time ago but I never cared for its paint scheme. The original was painted almost entirely red with only white decals. I painted mine red but I added black for the fins, reducers and nose cone. For the upscale I wanted a multiple color scheme so I opted for a white body tube with black fins and reducers and then trimmed with silver and red (Photo 2). Also it is not a true upscale because of the cooling fins. The original had only 8 and I wanted nine for symmetry. I decided to make mine out of fiberglass. The 4 times upscale showed that it would be 8 feet tall (Photo 3) and the fin span would be about 3 feet, and I knew I needed something substantial to withstand the forces of flight. I designed it around a 75 mm motor mount so it could be capable of (theoretically) Level 3 flights. Because of these differences I decided to call mine the Mars Snooper III. 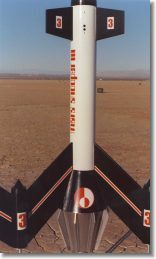 The first challenge was the general design of the rocket. With a 75 mm motor mount there wasn't enough room in the 4" body tube for both the longer motor and a parachute. 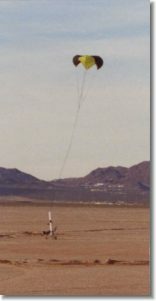 The parachute would have to go into the upper 3" body tube. How would they be connected to get the parachute attached to the lower section and still have access to install the electronics for ejection? I designed the motor mount tube to go all the way up to the top of the 4" tube and use a long coupler that the 3" upper section would slide over. The coupler would have to be long enough for screws to be installed above the upper transition. These screws would prevent the upper body tube from coming off at ejection. The electronics would be installed via a hole in the coupler and then slid down into the 4" body tube and attached. Photo 4 shows the motor mount with the fins before the 4" body tube is installed. 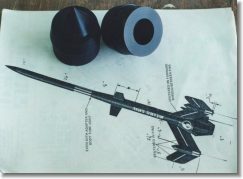 The motor mount extends to the top to the outer body tube and the coupler extends 12"s beyond it for the upper body tube to attach. The opening in the coupler tube allows the electronics to be installed and the lower opening is so it can be placed next to the outer 4" body tube. This allows the outer body tube to be freefrom a door to access the electronics. The design also proved to be a challenge because I knew the fins had to be attached to the motor mount very well. The fins would be heavy and the acceleration could easily rip them off if they were not attached well. The shock when the rocket landed would be even greater. 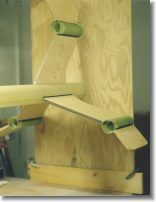 The fins were constructed from 1/8" G-10 fiberglass laminated with 3/16" plywood. The entire thickness would be a true scale 1/2 thick. For the fins outside the pods (Photo 5), I used slightly thinner 1/8" plywood so they are only 3/8" thick as well as the upper fins. To help absorb the shock on landing I decided to have retractable legs that were spring loaded. 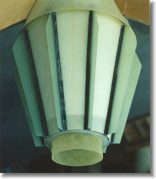 This was accomplished by attaching the fins to an inner 1 1/2" fiberglass tube. This inner tube would house the spring for the legs. The 2 1/4" tube would surround this inner tube to give the pods a through the wall fin mount (Photo 6). 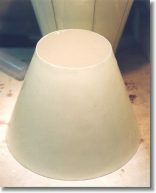 The pod nose cones (Photo 7) were turned from stock nylon by my father and would be glued on after a 1/2" brass tubing was epoxied inside to guide the leg as it retracted (Photo 8). The nose cone had to be hollowed to allow the leg to travel inside from the 2" compression of the spring. Each fin weighed about 4 pounds without the leg. The fins were attached one at a time usinga jig to hold each leg in place until all could be securely fastened (Photo 9). Attaching each fin was a several step process. Each fin was tacked in placed with slow CA. Then carbon fiber was used to run the length of the fin and covered with more CA. 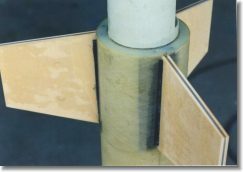 A thin layer of 5 minute epoxy coated the first layer of carbon fiber to hold each fin strong enough to rotate the rocket and attach another fin. (Photo 12). This was just the joint at the motor mount. The 4" body tube was slid over and tacked in place. Carbon fiber was used with CA over the length of the fins and lightly coated with 5 minute epoxy. The inside joint was also coated with a layer of carbon fiber and completely soaked with 2 hour epoxy (Photo 13). Because the lower part of the fin would be covered with one of the transitions I could also build up the fin underneath the cowling. (Photo 14) was used to soak the carbon fibers. The upper fins were attached in a similar fashion. They also had through the wall fin construction and even the 3" inner tube was slotted. The coupler to hold the upper parachute compartment extended down below the upper fins and provided additional support. The joints were also re-enforced with carbon fiber and inner fillets were also used (Photo 15). Three transitions had to be made, the upper transition for the 3" body tube to the 4" body tube, a transition at the 4" body tube at the fins, and the lower reducer acting like the motor with "cooling fins". All were cut out of poster board and then coated with three layers of 6 oz fine weave fiberglass and 2 hour epoxy. 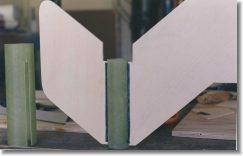 The upper and lower transitions could be built "in place" attaching the paper directly to the body tube and centering ring (Photo 16). The transition at the fins could not because of the through the wall construction. It was placed temporarily on a jig and covered with the fiberglass and epoxy (Photo 17). When dried it was cut for the fin slots and then sliced and installed on the rocket. 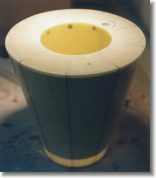 The "engine" reducer had nine "cooling fins" made from 3/32" fiberglass and attached with the standard CA, carbon fiber, and epoxy joint (Photo 18). All the transitions were filled with expanding foam to give them rigidity. How was the rocket going to be guided at takeoff? 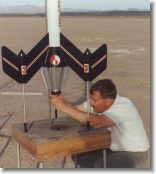 The original rocket used two launch lugs attached to both sets of fins set far enough from the body tube to allow the rod to clear the transitions. That would never work for this rocket. I decided to still use a 1/2" launch lug but attached directly to the 4" body tube that passed through the transitions. This also proved to be a challenge. 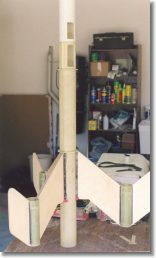 I used two sections of PVC pipe, one for each transition and then aligned them up with a standard launch lug (Photo 19). The two transitions were epoxied together sandwiching layers of carbon fiber. The launch lug fit nicely inside the PVC pipe and was used to align the two pieces together. The legs were constructed from solid 1/2" aluminum and the feet were made from black plastic pipe that I found in the hardware store that fit just beautifully over the legs. The legs were machined by my father with a groove to allow a snap ring to hold a washer that would push up on the spring. They were kept from falling out by a 1/8" aluminum plate that was attached to the bottom of the pods. In between the two tubes of the pod were 6-32 standoffs (Photo 20) that the plates would be screwed into. 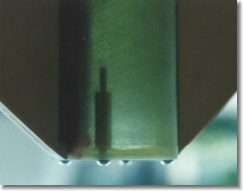 The Center of Pressure was calculated and it is located about an inch below the top of the main fins. I knew that nose weight would have to be added for stability. 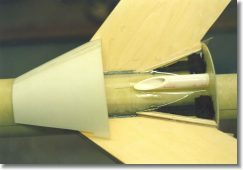 Five pounds of lead shot were epoxied into the fiberglass nose cone that surrounded a 5/16th" piece of all thread (Photo 21). The all thread is used to attach the parachute to the nose cone via a closed eye bolt. The rocket was nearly finished except for a few touch ups for the Turkey Shoot 2000 launch but I came down with the flu and just couldn't complete it. Springfest 2001 came around and I was determined to fly it. Several people commented on the looks and I started to get nervous. Am I really going to fly this rocket (Photo 22)? With an empty weight of nearly 25 pounds, I knew I would need a big chute. 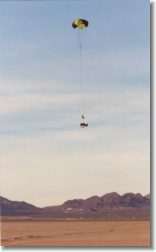 I ordered the 15 foot military surplus chute and at the launch field it was quickly apparent that it would never work. I managed to get it into the rocket but I knew that it would never deploy. 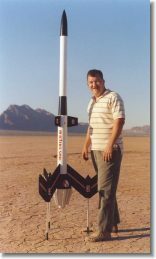 Fortunately Dave Flynn volunteered a Rocketman R9C and I had a R7C that could be used for the nose cone. The L850 was assembled and the ALTACC installed and it was ready to fly. I used my custom launch pad that consisted of basically a table with a hole in it and a launch rod. Its a great design because the weight of the rocket sits on the table rather that the hanging off the rod. 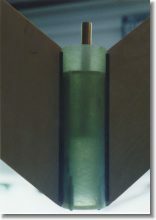 The launch rod is used entirely for guidance rather than supporting weight (Photo 23). Even still I heard cracks about serving tea out in the launch area (sigh). The table was staked down to prevent tipping over and the igniter installed. The winds were too strong most of the day but had been dying down. Thenervousness was turning into butterflies, launching a very unusual design that weighed about 35 pounds at takeoff from a 6 foot 1/2" launch rod. It was stable but the design still made it risky in a wind. The simulations had it stable in flight at about 40"s and it did have an 8 to 1 thrust to weight ratio. To top it off, I was using too small of a chute for the booster. Hit the button anyway. The launch was perfect (Photo 24). It climbed straight and seemed to continue for a long time (Photo 25). Very little weather cocking was evident and right at apogee the rocket separated. The nose cone chute opened right away but I wasn't breathing until I saw the booster chute. After an eternity passed without breathing I saw the booster chute opened (Photo 26). I saw both chutes out but knew that the chute for the booster was too small. It was designed for a 15 pound rocket and the booster had to weigh at least 22 pounds. What was I thinking! It landed and the spring loaded legs helped cushion the impact but all three legs bent upon hitting that hard dry lake bed (Photo 27). One of the reasons that I wanted removable legs was that if they were damaged on landing, they could easily be replaced. Dave says that I should use stronger springs and aluminum for the legs. I'll probably do that if I ever fly it again. Other than the legs there was only cosmetic damage where the outer fin had attached to the pod. This was probably caused more by tipping over than the actual impact on landing. Nowhere the main fins attached to the rockets body were there any signs of cracking. The tedious re-enforcing had paid off. Overall the Mars Snooper III provided me with valuable experience and a whole host of emotions. Everything from loving it to wanting it off my workbench because I was sick of the sight of it. Will it fly again? Perhaps not. I like the design of it so much I'm considering just using for a conversation piece and taking it to science fairs and such to promote HPR.